This guide is written for access management designers, developers, and administrators who build, deploy, and maintain AM services and features for their organizations. The challenges of securing such identity data and the environments that depend on the identity data are daunting. Organizations that expand their services through internal development or acquisitions must manage identities across a wide spectrum of identity infrastructures. This expansion requires a careful integration of disparate access management systems, platform-dependent architectures with limited scalability, and ad-hoc security components. 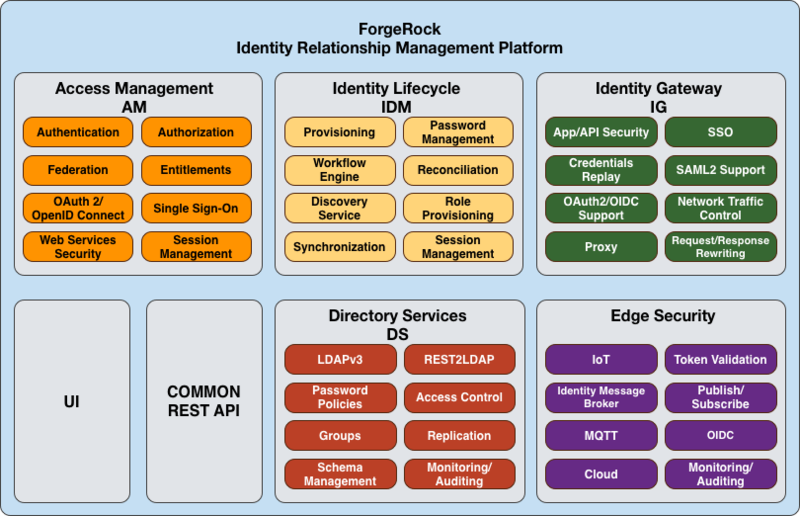 ForgeRock Access Management. Context-based access management system. AM is an all-in-one industry-leading access management solution, providing authentication, authorization, federation, Web services security, adaptive risk, and entitlements services among many other features. AM is deployed as a simple .war file, featuring an architecture that is platform independent, flexible, and extensible, and highly available and scalable. AM-6.5.1.war The distribution .war file includes the core server code with an embedded DS server, which stores configuration data and simplifies deployments. The distribution includes an administrative graphical user interface (GUI) Web console. During installation, the .war file accesses properties to obtain the fully qualified domain name, port, context path, and the location of the configuration folder. These properties can be obtained from the boot.json file in the AM installation directory, from environment variables, or from a combination of the two. This file is also available to download individually. AM-Soap-STS-Server-6.5.1.war AM provides a SOAP-based security token service (STS) server that issues tokens based on the WS-Security protocol[a]. SSOAdminTools-5.1.2.3.zip AM provides an ssoadm command-line tool that allows administrators to configure and maintain AM as well as create their own configuration scripts. The zip distribution file contains binaries, properties file, script templates, and setup scripts for UNIX and windows servers. SSOConfiguratorTools-5.1.2.3.zip AM provides configuration and upgrade tools for installing and maintaining your server. The zip distribution file contains libraries, legal notices, and supported binaries for these configuration tools. Also, you can view example configuration and upgrade properties files that can be used as a template for your deployments. Fedlet-6.5.1.zip AM provides an AM Fedlet, a light-weight SAML v2.0 service provider. The Fedlet lets you set up a federated deployment without the need of a fully-featured service provider. IDPDiscovery-6.5.1.war AM provides an IdP Discovery Profile (SAMLv2 binding profile) for its IdP Discovery service. The profile keeps track of the identity providers for each user. sample-trees-6.5.1.zip Clean installs of AM provide ready-made sample authentication trees to demonstrate how they can be put together. These sample trees are not installed by default if you are upgrading an existing instance of AM. The sample-trees-6.5.1.zip file contains the sample trees in JSON files, ready for import by Amster command-line interface. For information on importing files by using Amster, see Importing Configuration Data in the Amster 6.5 User Guide. What are your high availability requirements? High availability refers to your system's ability to operate continuously for a specified length of time. It is important to design your system to prevent single points of failure and for continuous availability. Based on the size of your deployment, you can create an architecture using a single-site configuration. For larger deployments, consider implementing a multi-site configuration with replication. Client-based authentication sessions provide authentication high availability and are easier to deploy in global authentication environments, but the authentication session is held by the client. CTS-based authentication sessions provide high availability and keep the authentication session in your environment, but require consistent and fast replication across the CTS token store deployment. In-memory authentication sessions do not provide authentication high availability, but keep authentication session in your environment. Determine whether to configure AM to store sessions in the CTS token store or on the client. Client-based sessions allow for easier horizontal scaling but do not provide equivalent functionality to CTS-based sessions. Disable the AM API Explorer in production environments. For more information, see API Explorer in the Development Guide. When configured to store sessions in the client, AM does not write the sessions to the CTS token store. Instead, AM uses the CTS token store for session blacklists. Session blacklisting is an optional AM feature that provides logout integrity. In AM deployments storing sessions in the CTS token store, the AM server that satisfies the request maintains the session in its in-memory cache to improve performance. If a request for the same user is sent to another AM server, that server must retrieve the session from the CTS token store, incurring a performance overhead. Client-based sessions are held by the client and passed to AM on each request. Client-based sessions should be signed and encrypted for security reasons, but decrypting the session may an expensive operation for AM to perform on each request depending on the signing and/or encryption algorithms. To improve performance, the decrypt sequence is cached in AM's memory. If a request for the same user is sent to another AM server, that server must decrypt the session again, incurring a performance overhead. Therefore, even if sticky load balancing is not a requirement when deploying AM, it is recommended for performance. CTS-based and client-based authentication sessions and client-based authentication sessions share the same characteristics as their CTS-based and client-based session counterparts. Therefore, their performance also benefits from sticky load balancing. In-memory authentication sessions, however, require sticky load balancing to ensure the same AM server handles the authentication flow for a user. If a request is sent to a different AM server, the authentication flow will start anew. URL Checking and Correction. Web and Java agents require that clients accessing protected resources use valid URLs with fully qualified domain names (FQDNs). If invalid URLs are referenced, policy evaluation can fail as the FQDN will not match the requested URL, leading to blocked access to the resource. Misconfigured URLs can also result in incorrect policy evaluation for subsequent access requests. Use FQDN checking and correction when clients may specify a resource URL that differs from the FQDN configured in AM's policies, for example, in environments with load balancers and virtual hosts. POST Data Preservation. Web and Java agents can preserve HTML form data posted to a protected resource by an unauthenticated client. Upon successful authentication, the agent recovers the data stored in the cache and auto-submits it to the protected resource. Use POST data preservation, for example, when users or clients submit large amounts of data, such as blog posts and wiki pages, and their sessions are short-lived. In AM deployments with CTS-based sessions, the set of servers comprising a site provides uninterrupted service. CTS-based sessions are shared among all servers in a site. If one of the AM servers goes down, other servers in the site read the user session data from the CTS token store, allowing the user to run new transactions or requests without re-authenticating to the system. The same is true for CTS-based authentication sessions; if one of the AM servers becomes unavailable while authenticating a user, any other server in the site can read the authentication session data from the CTS token store and continue with the authentication flow. AM provides uninterrupted session availability if all servers in a site use the same CTS token store, which is replicated across all servers. For more information, see "Implementing the Core Token Service" in the Installation Guide. AM deployments configured for client-based sessions do not use the CTS token store for session storage and retrieval to make sessions highly available. Instead, sessions are stored in HTTP cookies on clients. The same is true for client-based authentication sessions. Authentication sessions stored in AM's memory are not highly available. If the AM server authenticating a user becomes unavailable during the authentication flow, the user needs to start the authentication flow again on a different server. Identity Data Stores. For identity repositories, AM provides built-in support for LDAP repositories. You can implement a number of different directory server vendors for storing your identity data, allowing you to configure your directory servers in a number of deployment typologies. For a list of supported data stores, see "Directory Server Requirements" in the Release Notes. When configuring external LDAP Identity data stores, you must manually carry out additional installation tasks that could require a bit more time for the configuration process. For example, you must manually add schema definitions, access control instructions (ACIs), privileges for reading and updating the schema, and resetting user passwords. For more information, see "Preparing Identity Repositories" in the Installation Guide. Configuration Data Stores. AM stores configuration data in the embedded DS server. Configuration data includes authentication information that defines how users and groups authenticate, identity data store information, service information, policy information for evaluation, and partner server information that can send trusted SAML assertions. For a list of supported data stores, see "Directory Server Requirements" in the Release Notes. CTS Data Stores. The CTS provides persistent and highly available token storage for AM CTS-based sessions and authentication sessions, OAuth 2.0, UMA, client-based session blacklist (if enabled), client-based authentication session whitelist (if enabled), SAML 2.0 tokens for Security Token Service token validation and cancellation (if enabled), push notification for authentication, and cluster-wide notification. "Site Deployment With External Datastores" shows a back end deployment with replicated external DS instances for configuration, identities, CTS, policy, and application data. You can use load balancers to spread the load or throttle performance for the external data stores. Although not shown in the diagram, you can also set up a directory tier, separating the application tier from the repositories with another firewall. This tier provides added security for your identity repository or policy data. AM offers different ways of storing session information to suit your environment needs. If your environment requires session high availability, AM can store sessions in the CTS token store. Even if a server fails or the client browser crashes, the session remains available as long as the CTS is available. For a service that stores CTS-based sessions, access, and refresh tokens, or other authentication-related data in the CTS backing store, what is the average session or access/refresh token size? What is the average total size of CTS data? For example, suppose that the deployment only handles CTS-based SSO sessions, session entries occupy on average 20 KB of memory, and that you anticipate on average 100,000 active sessions. In that case, you would estimate the need for 2 GB (100,000 x 20,000) RAM on average if you wanted to cache all the session data in memory. If you expect that sometimes the number of active sessions could rise to 200,000, then you would plan for 4 GB RAM for the session cache. Keep in mind that this is extra memory needed in addition to memory needed for everything else that the system does including running AM server. Memory depends on space for AM code, on the number of live connections AM maintains, on caching of configuration data, user profile data, and CTS-based session data, and importantly, on holding embedded directory server data in memory. The AM code in memory probably never changes while the server is running, as JSPs deployed are unlikely ever to change in production. The installation of AM with an embedded DS server requires free disk space equal to or greater than 5 GB, plus 5% of the total size of the filesystem on AM's configuration directory. By default, AM servers write audit logs to flat files under config-dir/openam/logs/. Alternatively, AM servers can write audit logs to syslog, or to a relational database. By default, AM servers write debug logs to flat files under config-dir/openam/debug/. AM lets you configure rotation for debug logs. As you can change debug log levels at runtime when investigating issues, debug log volume is not as predictable as for regular logs. Leave a margin in production environments, so that you can turn up debug log levels to diagnose problems. Embedded DS server log files are stored under config-dir/opends/logs/. As for AM, you can configure DS server log rotation and purging. The default cap for access logs is 2 GB. By default, AM stores CTS information in the configuration directory. The space this takes up depends on the volume of traffic to the server and whether AM is configured for client-based sessions. Defaults can be limited to 1024 file descriptors per user on Linux systems. Consider increasing this limit to at least 64K. For details, see "Setting Maximum File Descriptors and Processes Per User" in the Installation Guide. [a] Federation-related pages do not display when using Java 11. For more information, see the Knowledge Base. This section lists supported directory servers. AM supports several versions of web agents and Java agents. For supported container versions and other platform requirements related to agents, refer to the ForgeRock Access Management Web Agents Release Notes and the ForgeRock Access Management Java Agents Release Notes. Prepare the Directory Servers. Prepare the configuration directory server, DS for the core token service (CTS), and the LDAP identity repository. For information on installing data repositories, see "Preparing for Deployment" in the Installation Guide. Obtain the AM Software. The ForgeRock BackStage website hosts downloadable versions of AM, including a .zip file with all of the AM components, the .war file, AM tools, the configurator, web and Java agents, IG, and documentation. Verify that you review the Software License and Subscription Agreement presented before you download AM files. Configure Session Location. Configure AM to store sessions in the CTS token store or in the client. For more information on session location, see "Session Storage Location" in the Authentication and Single Sign-On Guide.